2000 was a relatively cool, late-ripening year, creating particularly good conditions for Merlot. 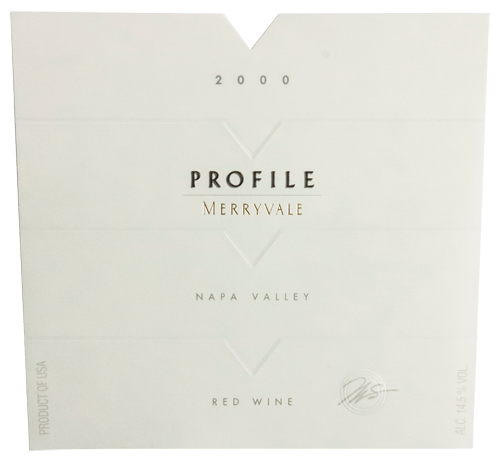 As a result, we had plenty of excellent Merlot to work with and the 2000 Profile blend has a little more Merlot in it than other years. The Cabernet came from Oakville, Rutherford and St. Helena and was loaded with the rich flavors and dense, supple texture I look for. The wine was fermented with native yeasts, aged in mostly new French oak chateau ferre barrels and was bottled unfiltered. It is opulently structured and very dark. Merryvale Estate, Beckstoffer-Georges III, VI, ToKalon and Las Amigas Vineyards, Showket and Oak Creek. “…even though it accounts for just over half of the blend with merlot (40 percent), cabernet franc (3) and petit verdot (1). It gives a dry expression of Napa, dark in tone, black as a starry night sky. Though powerful in its tannic richness, the wine is stepped back from aggressive, more austere than in your face. This should age beautifully; or decant it now for a steak.